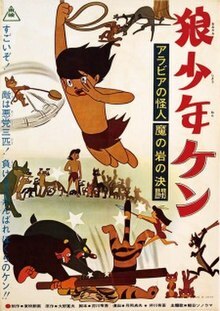 Wolf Boy Ken (狼少年ケン, Ōkami Shōnen Ken) is the first anime series produced by Toei Animation (then Toei Doga). The series is known for having more frames per second than other anime of the same time. The series also implemented sponsorship by a large corporation, in this case, Morinaga Candy Company. An English pilot was created to pitch for America but was scrapped. The test pilot featured the voices of Daws Butler and Don Messick. Ken is a young boy who was raised by wolves (similar to Mowgli) in a jungle in the Himalayan Mountains. One day a meteor hits the jungle, causing a drastic change. This eventually leads to famine and a need for certain animals to relocate. Ken tries to help the animals as much as possible, in particular he watches over two young wolf cubs named Chichi and Poppo. Jack, a one-eyed wolf, doesn't like Ken as he is a human living among them. One day, Ken saves Jack's life. Jack later has the opportunity to let Ken die when he is bitten by a poisonous snake, but decides to return the favor and save his life instead. This mutual affair causes a friendship to form between the two, and they team up to save the other animals from predators and humans. This page was last edited on 25 March 2019, at 08:09 (UTC).